3D printing – also known as additive manufacturing – is a highly customizable manufacturing technique that turns digital 3D models into solid objects by building them up in layers. The technology was first invented in the 1980s, and since that time has been used for rapid prototyping. Industrial 3D printing is at a tipping point and is about to go mainstream in a big way. It has been predicted that the industry will go through revolutionary changes when 3D printing becomes more widespread. Technology has moved well beyond prototyping, rapid tooling, trinkets and toys; additive manufacturing is creating durable and safe products for sale to real customers in moderate to large quantities, thereby creating economies of scale. This revolution began in 2014, when a survey of over a 100 manufacturing companies revealed that 11% of them had already switched to volume production of 3D printed parts or products; according to our definition we judge a particular technology to be mainstream when it reaches an adoption level of over 15%. Numerous companies in multiple industries are ramping up production in this way and we are confident that 3D printing is ready to emerge from its nascent stage to become a viable alternative to conventional manufacturing in multiple industries for various applications. More companies will follow the major players and with this revolutionary shift, companies should start engaging strategically to improve their offerings, revisit their operations and assess the implications it could have on the commercial ecosystem as a whole. The aerospace industry has become an aggressive target for the development of new 3D printing techniques. Aerospace technicians have already started using 3D printing methods to manufacture parts such as various components of gas turbine engines (e.g. heat exchangers, fuel nozzles, airfoils, blades, vanes and impellers). Innovation for 3D printing in aerospace were first filed in 1979 by United Technologies Corp. for the manufacturing process of thin fin knife-edge gas path seals and disc-shaped articles for a gas turbine engine using energy beam to melt the nickel-based alloy in a layer-by layer fashion. Thereafter, the innovations have developed at a good pace. With the help of 3D printing, products with complex geometries can be manufactured easily. 3D printing is already widely used in the aerospace industry. It is used for making a wide variety of complex geometries including, but not limited to, airfoils with complicated internal cooling passages, fuel injectors, heat exchangers, blades, vanes, fuselage and wing ribs, combustor liners and electronic components. With a high degree of accuracy and precision, 3D printing is not only limited to such parts/components manufacturing but also involves tooling applications such as cores and/or inserts for die casting, jigs, vices etc. that are useful for manufacturing different aerospace components. Digital modelling technologies in conjunction with 3D printing have offered significant advantages to the manufacturers in aerospace industry. Initially, much emphasis was laid on manufacturing gas turbine blades using 3D printing in order to improve its durability in high temperature prone conditions. Realizing the potential of rapid prototyping with the help of 3D printing, the scientific community, till 2005, used this technology as fast and efficient method of constructing custom devices such as inspection devices, test models etc. Thereafter, apart from constructing aerospace parts, the technology was used in repairing of various aerospace parts and in particular, airfoils, blades and vanes. After 2010, the focus of inventions shifted towards 3D printed aerospace parts/components, especially gas turbine engine components as end use product rather than making tools like casting core, die etc. that are further used in making such components. Selective laser sintering, selective laser melting, electron beam melting and direct metal laser sintering are highly used among the other methods and have proved their potential so far. Mainly metals and metal alloys (particularly, aluminium, titanium, nickel and cobalt metal and their alloys thereof) are preferred in the manufacturing of such aerospace parts/components. Key players in 3D printing in the aerospace domain are United Technologies, MTU Aero Engines, Boeing, Airbus, General Electric, Rolls-Royce, Siemens, Safran, Honeywell and Lockheed Martin. 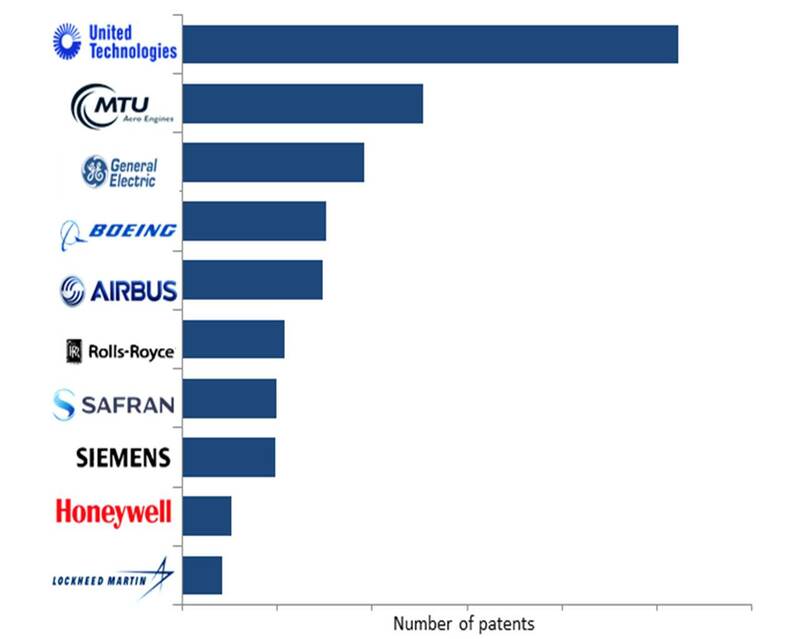 All these companies own a large number of patents for 3D printing in the aerospace industry. The majority of innovations for 3D printing in the aerospace industry have originated from the U.S.A, China and Germany, with U.S.A leading the way. 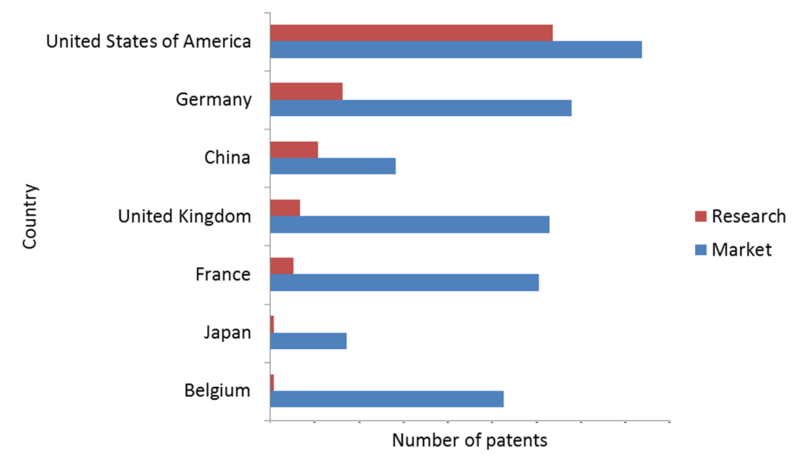 Among the total number of patents in “3D printing in Aerospace domain”, USA has filed 55.14% patents. Of these, 35.9% patents have their focus on aerospace parts/components like aircraft components (wings, body, structural components etc. ), UAVs components (avionics, flight control etc. ), spacecraft components, defense weaponry and tooling. This means that the organizations, academia and independent inventors in USA mainly focus on improving gas turbine engine components (in particular, airfoils (blades or vanes), BOAS, fuel injectors and fuel lines, turbine shroud and combustor liners). The number of patent filing increases drastically from 2011 to 2014 in USA but the numbers are declining since then. One reason could be that the patent filings of United Technologies Corp. have started declining. Noteworthy, 2015 onwards, researches from United Technologies and General Electric has shifted their focus on cooling of hot gas path components of gas turbine engine like airfoil (blade and/or vane), shroud, combustor liner, turbine bucket etc. United Technologies is primarily focused on gas turbine engine parts, for fixed-wing aircrafts and/or rotorcrafts, followed by their interest in manufacturing tools for use in the aerospace industry. In USA, General Electric has its focus mainly in aircraft and/or gas turbine engine components, particularly in airfoils (blades or vanes). Surprisingly, a large number of patent filing in “3D printing in Aerospace” domain is done in the year 2015 and 2016 demonstrating a steep rise in its patent filings. Until 2014, Boeing and Airbus were ahead of General Electric in terms of patent portfolio. But, now not only General electric is ahead these two organizations but it is now in direct competition with MTU Aero Engines. Unlike other key industry players in USA, Boeing is involved with the structure of the fixed-wing aircraft, focusing in particular on fuselage and wings and other control surface components. elements, etc. but among all assignees in 3D printing in aerospace domain, it has filed maximum patents in cosmonautics. Creativity, customizability and sustainability in 3D printing allow manufacturing of any desired geometry with desired properties and functions that were previously restricted by the constraints of conventional production processes. But transformative applications of 3D printing in aerospace industry like printing satellite parts in space after space-mining are on their way. 3D printing holds much more which is yet to be explore and will bring revolutionary changes in aerospace industry that hasn’t happened ever before. To define, describe, and project the 3D printing for aerospace based on application, material, production methods used in 3D printing, scanning and modelling techniques, technical challenges faced and regions of interest (research and market areas- country wise analysis). To analyze the opportunities offered by 3D printing technology in various segments of aerospace industry. To identify key disruptions (their impact and their current state analysis), mega trends predictions and considerations for the future, recommendations for starting new research/ development programs in 3D printing in aerospace (including recommendations on acquisition/ collaborations/ licensing). This report is a Handbook of Innovations & Technologies (HIT), in the domain of 3D printing in the aerospace industry and provides insights into the technical challenges, existing solutions, innovation trends, market trends and key participants in the innovation ecosystem. This report is essential reading for everyone associated with the domain of 3D printing, providing clear answers to problems and issues faced, enabling them to take key decisions. For example, this report can be beneficial to CEOs, heads and members of R&D departments, heads and members of IP/strategy departments, heads and members of HR departments, heads and members of marketing departments, academic researchers and scientists, patent agents and/or attorneys, as well as investors and consultants operating in the domain of both the 3D printing and aerospace industries. Which specific materials are used for 3D printing in the aerospace industry? What are the major IP stumbling blocks (dark spaces) in 3D printing in Aerospace domain? What patenting strategies are being adopted by major players in 3D printing in Aerospace domain (jurisdictions, type of claims, patent maintenance, etc.)? What are the major law firms/agents involved in 3D printing in Aerospace domain? To prepare this report, multiple diverse searches were conducted to comprehensively identify all the patents pertinent to 3D printing in the aerospace industry. These patents were then analyzed manually to capture their focus and application areas and identify the technical challenges. Thereafter, informative and actionable insights were generated by combining this manual information with the bibliographic information of the patents. Expert industry analysis has also been included as part of the research. This section highlights technology evolution (patent filing trends), primary countries of research, major market geographies, existing collaborations and opportunities, new entrants, key patents, most active law firms, prominent inventors and important IPC classes as well as key player’s IP position in the domain of 3D printing. This section highlights the focus of patents and applications relating to the production methods used in 3D printing, scanning and modelling techniques disclosed, materials used for 3D printing, applicable products being targeted and technical challenges faced. This section provides an analysis of the major players in the domain focusing on their patent filing trends, their research centers, markets of interest, technology focus, partnerships, strategies and other important parameters. Table 12 - Top art units in the U.S.